It is really quite amazing how much historical evidence still exists to tell us the early history of the Montgomery Methodist Church in Montgomery, Texas. In fact, we are very blessed in that the complete journal of the quarterly meetings for the Montgomery Circuit from 1839-1850 still exists. This is an amazing primary document that gives us many important details of the early history of Methodism between the Brazos and Trinity Rivers and between the San Antonio Road and San Felipe. It appears that this particular journal is so rare that it may even be unique. In fact, many of the early historians of Texas Methodism appear to have relied heavily on this particular document as a rare example of quarterly conference meetings as early as 138 years ago (Thrall, 1872). Before going further, it is necessary to define what a "circuit" and a "circuit rider" were. Joseph Anderson provides a number of useful definitions in his 1909 book entitled A Brief Work on Methodist Terminology Prepared in the Interest of Ministers, Members and Friends of the Methodist Episcopal Church, (New York, Eaton & Mains), page 24. Circuit. - Is composed of two or more preaching places, constituting a pastoral charge. Circuit Rider. - A Methodist preacher on horseback going from one appointment to another on his circuit of large dimensions and many preaching places, to which he has been officially assigned. In early Methodism this was the almost universal mode of travel. Thrown across the saddle was a pair of large pockets made of leather, called "saddle pockets," containing Bibles, hymn books, Disciplines, and other books and periodicals, to be sold and for the minister's use, along with articles of clothing, so constituting library and wardrobe. Much of his reading and sermon-making was done in the saddle. His was pioneer gospel missionary work, which prepared the way for smaller circuits, and stations with capacious church edifices and large congregations of worshipers. Pastoral Charge. - A local society, circuit, or station placed in official charge of a minister. See Joseph Anderson's 1909 book entitled A Brief Work on Methodist Terminology Prepared in the Interest of Ministers, Members and Friends of the Methodist Episcopal Church, (New York, Eaton & Mains), page 67. Originally, in 1838, the Montgomery Circuit was part of the Texas Mission District which was part of the Mississippi Conference of the Methodist Episcopal Church. The Texas Conference of the Methodist Episcopal Church would not be created until 1840. In the Minutes of the Mississippi Conference, held at Grenada, December 2, 1838, the following appointments are announced. Texas Mission district: L. Fowler, P.E. ; Galveston and Houston: Abel Stevens; Nacogdoches: Samuel A. Williams; Washington: R. Alexander, Isaac L. G. Strickland; Montgomery: Jesse Hord; Brazoria: Joseph P. Sneed. See Homer S. Thrall's book, History of Methodism in Texas, published in Houston, Texas by E. H. Cushing in 1872, page 52. The preacher initially appointed to the Montgomery circuit by the Mississippi Conference was Jesse Hord. As we will see on page 53 of Thrall's book, Isaac L. G. Strickland, who was originally assigned to the Washington circuit by the Mississippi Conference, would be re-assigned to the Montgomery circuit instead of Jesse Hord. However, Strickland would not be the circuit preacher of the Montgomery circuit for very long. Joseph P. Sneed would replace Strickland in March of 1839. It is also very important to note that when the circuit preacher appointments were announced for the Texas Mission District on December 3, 1838, there were only six Methodist circuit preachers for the whole Republic of Texas. These men were missionaries being sent into Texas to begin preaching Methodism at a rudimentary level. And, as we will see later, they were stretched very thin. The Montgomery Circuit was created, but there were no churches in the Montgomery Circuit. The first church would not be built until 1851. ...met at a log-cabin near San Augustine, where these appointments were remodelled, of course Mr. Fowler continuing as presiding elder: San Augustine, including Shelbyville and Nacogdoches, etc. S. A. Williams; Montgomery, all territory between the Trinity and Brazos Rivers, I. L. G. Strickland; Washington, including the upper settlements on the Colorado, R. Alexander; Egypt, including Brazoria County and westward to Guadalupe River, Jesse Hord. The Montgomery Circuit was huge, and included "all territory between the Trinity and Brazos Rivers." Isaac L. G. Strickland would not be the circuit preacher for the Mongomery Circuit for long. He was replaced by Joseph P. Sneed in March of 1839. Shortly after his replacement, Isaac L. G. Strickland, the first Methodist preacher/missionary on the Montgomery circuit would die near West Columbia on July 2, 1839. As shown in the primary document below, Isaac L.G. Strickland made an appearance at the first quarterly conference meeting of the Montgomery Circuit on February 25, 1839. See the first page of the "Journal of the church conference held at Montgomery 1839-1850" located in the Oscar Murray Addison Papers in the Dolph Briscoe Center for American History at the University of Texas at Austin [formerly the Barker Texas History Center] in Box 2A103. The first quarterly conference meeting of the Montgomery Circuit was held at John Spiller's on February 25, 1839. Littleton Fowler, the Presiding Elder of the Texas Mission District, and Isaac L.G. Strickland, the Circuit Rider/Preacher for the Montogmery Circuit were both present. The records of the quarterly conference meetings were originally kept on sepearte sheets of paper until a book was obtained to record the meetings. These sheets of paper are very rough around the edges but almost all of their contents can still be read. This was the infancy of the Methodist Epsicopal Church in the Montgomery Circuit. In February of 1839, there were 6 Societies. Three of these Societies were mentioned by name: Fantharps [Fanthorp's] Society, Robinsons Society and Spillers Society. There were 9 preaching places. There were no Local Preachers. And there were, of course, no church buildings mentioned anywhere in the Montgomery Circuit. "To deal with horses is learned very early by the young people of both sexes, and it affords a peculiar sight to watch girls and boys riding with their books to school on horseback. In the same manner people rode from the settlement to Montgomery, the county seat where divine service was usually held on Sundays. Mrs. Rigby and her women neighbors guided their horses as well as anyone of the cavalcade; nay, they often had a child sitting in front of them on the horse's back and would take part in our wanton pell-mell riding on our way home." See Gustav Dresel's Houston Journal, Adventures in North America and Texas, 1837-1841, Translated by Max Freund, (1954, Austin, University of Texas Press), page 83. Though an interesting anectdote, Dresel does not advise us which religious denomination's service he was attending in this entry. In 1840, the Montgomery Circuit had two preachers: Moses Spear and Robert Crawford. See Homer S. Thrall's book, History of Methodism in Texas, published in Houston, Texas by E. H. Cushing in 1872, page 57. Robert Crawford would witness a couple of deeds in which land was donated to build churches. JOSEPH LINDLEY and wife NANCY LINDLEY of the County of Montgomery of the 1st part and JOHN SPILLER, SR., Abner HOUSEON, RICHARD DAVIDSON, WILLIAM H. HULON & JAMES SMITH, all of Montgomery County & Republic of Texas witnesseth that Joseph and Nancy Lindley have given, grant and sell unto the above named, land in Montgomery County in trust that they shall erect or build a place of worship for the use of the members of the Methodist Episcopal Church. Wit: ROBERT CRAWFORD, R. H. OWEN. We also find the abstract of another deed witnessed by Robt. Crawford on page 20 which also mentions the erection of a house of worship for the members of the Methodist Episcopal Church. 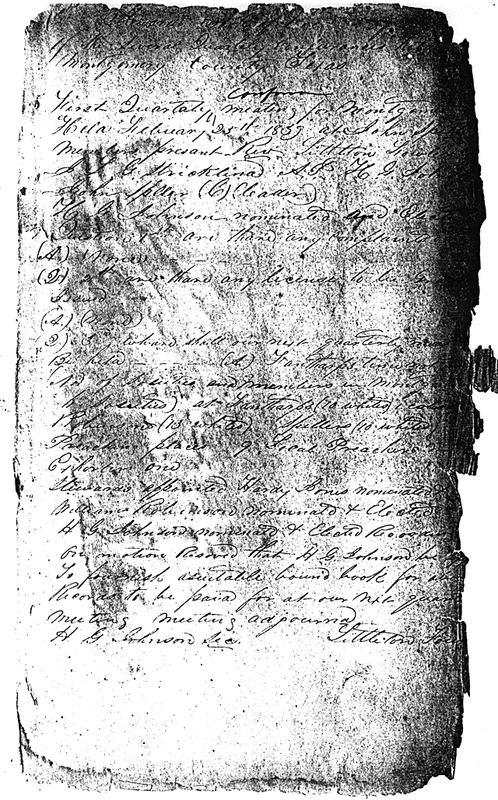 This deed is dated just a few days after (September 23, 1840) the one above (September 9, 1840). WILLIAM ROBINSON & ELIZABETH ROBINSON his wife of the one part and JAMES H. COLLARD, JACOB MATHEWS, JOSHUA ROBBINS & GEORGE ROBINSON, trustees in trust for the use and purposes of erecting a house or place of worship for use of the members of the Methodist Episcopal Church on 30-1/2 acres of land. /s/ William Robinson, Elizabeth (her mark) Robinson. Wit: H.W. HALL, ROBT. CRAWFORD. Neither of the these early deeds describes land for the Methodist church in the town of Montgomery. Though this land was transferred in 1840, it appears the first church to be built in the Montgomery Circuit would be the one built in the town of Montgomery in 1851. [The following were the appoint-]ments for 1841: San Augustine district: L. Fowler, P.E. ; San Augustine, F. Wilson; Nacogdoches to be supplied; Harrison, N Shook; Jasper, H. D. Palmer. Galveston district: S. A. Williams, P. E.; Galveston and Houston, Thomas O Summers; Brazoria, A. P. Manley; Montgomery, Richard Owen, J. H. Collard; Liberty to be supplied; Crockett, Daniel Carl; Nashville, R. Crawford. Rutersville district: R. Alexander, P. E.; Austin, J. Haynie; Washington, Jesse Hord; Centre Hill, R. H. Hill; Matagorda, D. N. V. Sullivan; Victoria, Joseph P. Sneed. C. Richardson, President of Rutersville college. In 1841, the Montgomery Circuit had two preachers: Richard Owen and J. H. Collard. See Homer S. Thrall's book, History of Methodism in Texas, published in Houston, Texas by E. H. Cushing in 1872, pages 64-65. J. H. Collard had been in the rear guard at the Battle of San Jacinto and was recruited as a preacher in the Montgomery Circuit where he lived. Thrall's information regarding the 1841 appointments from his History of Methodism in Texas (see above) is confirmed by this newspaper article that appeared in the Telegraph and Texas Register on January 6, 1841. San Augustine District - Littleton Fowler, P'dg. Eld. San Augustine - Francis Wilson. Jasper - Hendersen D. Palmer. Galveston District - Sam'l A. Williams, P.E. Galveston and Houston - Thos O. Summers. Montgomery - Rich'd Owen , Jas H. Collard. Rutersville District - Robert Alexander, P.E. Centre Hill - Robert H. Hill. Matagorda - Dan'l N.V. Sullivan. Victoria - Joseph P. Sneed. Chauncey Richardson, President of Rutersville College. Abel Stevens, transferred to Providence Conference. The next Conference to be holden at San Augustine, Dec. 23rd, 1841. N.B. Those in Italics are Elders. The two circuit preachers on the Montgomery Circuit in 1841 were Richard Owen and James H. Collard. In 1842, the Montgomery Circuit had one preacher, Daniel N. V. Sullivan. See Homer S. Thrall's book, History of Methodism in Texas, published in Houston, Texas by E. H. Cushing in 1872, pages 64-65. Parsonage, - The official residence of the parson, or preacher in charge, and is usually provided by the congregation. Parsonage and Furniture, Committee on. - This committee is appointed by the quarterly Conference for the purpose of building or renting, and funishing, at least with heavy furniture, a parsonage in each charge, for the use of its married pastor or his family. 1842 Methodist Parsonage for "Montgomery Circuit"
...Davidson. Another item worth noting is, that at the second quarterly conference for this circuit in 1842 it was "Resolved that the stewards of this circuit be and they are hereby appointed a committee to receive donations in land, money and other property for the purpose of building and furnishing with heavy furniture a parsonage for Montgomery circuit." This is the first instance we find of such steps being taken in Texas. See Macum Phelan's A History of Early Methodism in Texas 1817-1866, (1924, Nashville, Cokesbury), page 201. Where this parsonage was to be built (town of Montgomery or somewhere else) is not stated here. It just says "a parsonage for Montgomery circuit." The "Journal of the church conference held at Montgomery 1839-1850" in Box 2A103 in Oscar Murray Addison Papers at the Dolph Briscoe Center for American History at the University of Texas at Austin has shed some very interesting light on the parsonage in the Montgomery Circuit. The first parsonage was not built in 1842 and the first parsonage was not built in Montgomery. The circuit preacher assigned to the Montgomery circuit in 1843 was Daniel Carl. See Homer S. Thrall's book, History of Methodism in Texas, published in Houston, Texas by E. H. Cushing in 1872, page 70. Homer Thrall's information regarding the 1843 preacher appointments from his History of Methodism in Texas (see above) is confirmed by this newspaper article that appeared in the Telegraph and Texas Register on January 11, 1843. Houston " Thos. O. Summers. Brazos Circuit, John Wesley Kenney. Huntsville " James G. Johnson. Franklin " W. C. Lewis, J. Crawford. Nashville " Daniel N.V. Sullivan. See the January 11, 1843 edition of the Telegraph and Texas Register, page 2. The circuit preacher appointed for the Montgomery Circuit in 1843 was Daniel Carl. Until 1851, there were no churches, i.e. houses of worship, built anywhere in the Montgomery circuit. 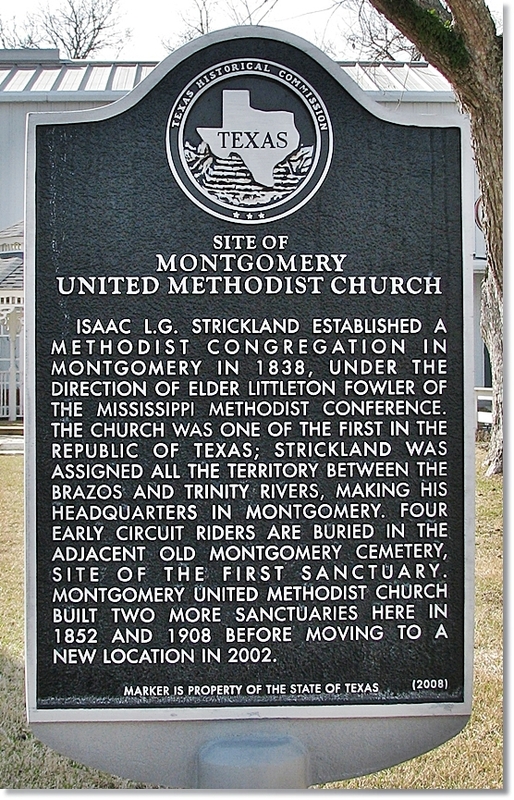 When Strickland originally arrived in the Montgomery Ciruit, he was referred to as a "missionary" because there were not very many Methodists or people of any faith in the Montgomery circuit. Many of these people were frontiersmen who had always been a couple of steps ahead of organized religion. In the dense crowd of whorshippers that assembled in St. John's to attend the dedication services, might have been seen a venerable man walking up the left-hand aisle. He was as straight as an arrow, six feet high, and his head as white as cotton. His apparel was plain, and contrasted singularly with that of the mass of elegantly dressed people. "I was raised, until fifteen, in the wilderness in the upper part of the State of Missouri. Our nearest neighbors were the Sioux and Osage Indians; we had to fight them often. During this time I never heard anything of religion, save I heard an old Hard-Shell Baptist preach, who, I was for years confident, was John the Baptist that I had heard of. My father moved to Texas in 1825. Soon after this I was in Allen's Settlement in Louisiana, where, for the first time, I heard of the Methodists. Noisy and frolicsome, as I had heard, the outside appearances pleased me, for I was all fun: war whoops, war-dances, and Indian-killing was the most I knew. But to return. I went to the Methodist camp-meeting on Flatlick, prepared for a frolic; but when I expected to hear the favorite war-whoop, I heard a sound I had never heard before. It seemed a voice from a tomb, all sweetend with love. I stopped my horse and looked around. All I saw llooked sorry for me, and I was sorry for myself; and then it struck me, if that is Methodism they are palying a game I never played. I had not yet hove in sight of the preacher, though I drew nearer, and was in hopes the sainted voice would become funny, but not the case. I saw old Father Henry Stevenson standing in a box talking to the people, who seemed charmed with what he was saying; but I paid no attention to anything but the voice. I was then sixteen; had never heard a chapter read or a sermon preached, save the one I thought was John the Baptist. I could not read, and did not know there ever was or had been a Saviour. I got down and took my seat on a log some distance from the preacher. I felt that I was in the wrong box. I would occasionally see the face of the speaker, and there seemed to be something on it; he seemed to be the most honest man I had ever seen. I would have given him my bottom dollar and Old Roan [his horse] if he had asked it. By this time something ailed me, but I did not know what. An old gentleman came to meand asked me if I would take a walk? I told him, gladly, for I thought there was a funny crowd out where he was going, and that would suit me better. I began to cheer up, and would occasionally use a bad word, at which the old man would groan. It struck me he was sick, and I did not feel well myself, but we had not gone far until he fell on his knees. I saw he had not fainted, and nobody had shot him. I was astonsihed; he said something I did not understand. When he got up I asked, 'What are you?' 'A Methodist' 'What have you been doing?' 'Praying.' 'Does anyone pray but Methodists?' 'Anyone can pray.' 'Can I pray?' 'Yes' 'Why did you not tell me before, for I must do something; I have felt bad ever since I saw that man in the box.' I told him I would go back and hear make his next speech, which I did, and in his sermon understood something of the paln of salvation. At the close of his sermon he invited all who wanted religion to go to the mourners' bench. I went, of course. This was the first mourners' bench I had ever seen. It was a split log with legs in it; the ends were east and west. I knelt, with my face towards the north. I felt sick, and not sick either. There came round abrother and told me to give up all to God. I told him I had nothing but Roan, and he was welcome to him if he wanted him. The brother told me my error; I then began to try to say, 'Not my will, but thine be done.' An hour afterward I suddenly felt that I was in the middle of a dark world, in the middle of a dark room, on my kees on a black pile of powder, and it flashed, and I went up with it. I then found out what was on the old preacher's face; it was glory! It was on everything I could see. The trees, the ground, the people, all seemed glorious. Brother, you know how I felt; I felt glorious; and even now, while I write I can hardly stand it. I felt glorious and triumphant in my blessedSaviour. I began to meditate, to see if I could understand why I was so happy. I first hought I was mistaken in the boy; it was not Tom, it as somebody else. After close examination I could not decide until I recollected I had mashed my finger-nail not long before, and there was a white speck under the nail if it was Tom. I looked and it was there. Then I traced the finger to the hand, and along the arm to the body, and found it was Tom Parmer, and shouted, 'Glory! Glory!' The next morning Father Stevenson gave me a Bible and hymn-book, with these words: 'Take these, my son, and be faithful.'" Young Parmer started for his Texas home singing tow verses of "Jesus, my all, to heaven has gone," the only hymn he had learned. He at once commenced holding prayers in his father's family. Five years after, Henry Stevenson visited Texas. His young friend had learned to read the Bible, ans was still faithful. At Mr. Teel's, where Father Stevenson preached, young Parmer formed the acquaintance of Mis Rachel Teel, who was not then a professor of religion, and had from some causes failed to hear preaching. He says of her, "I thought she would suit me if she had religion, and I thought it was only necessary for her to hear Father Stevenson preach to make her religious. Not long afterward he had an appointment to preach on Bayou Sara, La. This young lady and another and myself went to hear him. We had to ride twenty miles the last morning before preaching. Father Stevenson was just taking his text as we got in. It was 'Martha, thou art careful and troubled about much serving,' etc. The two young ladies were quite gay. They had got hold of some starch that a merchant had brought to Texas, and used some, and felt exalted. 'But Mary has chosen the good part which shall not be taken away from her.' Father Stevenson had got about half through his sermon when he took the starch out of the girls, and they both cried aloud for prayer, and were soon converted. Rachel and I fixed up things at once. I was now a married Methodist, with a Methodist wife." Mr. Parmer settled near Sabine Bay, and in 1834 Father Stevenson visited him and preached in his house. subsequently he lived in Walker Co., and was a near neighbor to Gen. Sam Houston. Gen. Houston often declared that the conversations and parayers of Tom Parmer had been of unspeakable advantage to him when he was seeking religion. The old General, as is well known, after he professed religion united with the Baptist church. After various moves, Mr. Parmer and his excellent wife are now residents of Galveston Island, and worshippers in St. John's Church. Until 1851, there were only societies in the Montgomery Circuit. As people within the Montgomery Circuit converted to Methodism, they formed "societies." These societies were Methodist believers in a particualr neighborhood, settlement or community. These societies were intially very small. The societies would meet for the Sabbath at people's houses or in other buildings which were not churches. Between 1839 and 1851, there were no churches (houses of worship built exclusively for the purpose) in the Montgomery Circuit. The first building built to be a church or house of worship in the Montgomery Circuit was Alexander Chapel in Montgomery in 1851. Below is a list of the societies listed in the "Journal of the church conference held at Montgomery, Texas, 1839-1850." Again we find no mention of any churches in the "Journal of the church conference held at Montgomery, Texas, 1839-1850." Mill Creek, Wm. F. Hubert, Joseph Derrhammer. See Macum Phelan's A History of Early Methodism in Texas 1817-1866, (1924, Nashville, Cokesbury), page 322-323. The 1851 appointments for Montgomery were A. B. F. Kerr and G. W. Rabb. Rabb does not appear to have lived long after his appointment. This marker in the Old Methodist Cemetery in Montgomery, Texas indicates that he died in January of 1851. However, Homer S. Thrall indicates a death year of 1850 for G. W. Rabb. The above is the official list, as published in the General Minutes, but it is incomplete. In the appointments as they appear in the Texas Wesleyan Banner, following the conference, are the following additions: C. Richardson, editor of the Banner; a Montgomery station appears with Jas. G. Johnson in charge,..."
With the appointment of James G. Johnson, the Methodists in the town Montgomery would no longer have to rely on circuit preachers to occasionally come through. Prior to his appointment as the stationed preacher in the town of Montgomery, James G. Johnson had been circuit preacher for the Montgomery Circuit in 1845. Below is an article written by C. Richardson in July of 1851 regarding the dedication of the Methodist Church in Montgomery, Texas. This is the earliest record of a Methodist Church building for worship being built in Montgomery that we have located so far. If you have a primary record referring to an earlier church building for worship, please let us know. DEDICATION OF ALEXANDER CHAPEL, MONTGOMERY, TEXAS. In the flourishing village of Montgomery, Methodism seems to be permanently established. At an early period in the exploration of Texas by missionaries of the Methodist Church, this place was visited, but of the success of their labors here for several years, we are not prepared to speak definitely. But in our visit to this town on last Sabbath we found a church of some thirty odd members, most of whom are truly devoted Christians, and te-totalists. They have evinced their Christian enterprise in sustaining a stationed preacher, and in the erection of a neat and commodious chapel, which was dedicated to the worship of Almighty God on last Sabbath. A quarterly meeting was in progress, the services of which commenced on Friday. We were not able to reach the town before Saturday night, being just in time to listen to an excellent sermon from Rev. George Rottenstein, which was followed by a warm and persuasive exhortation from Rev. R. Alexander at the close of which, mourners were called to the altar, and prayers were offered in their behalf. An interesting and animated love-feast preceded the public services of the Sabbath. The narrations of Christian experience were lively and expressive of deep religious feeling. It was precious season for many. It was our pleasure to conduct the dedicatory services of the new chapel, which is to be called Alexander Chapel, in compliment of Rev. R. Alexander, the Presiding Elder, of the Ruterville District, who has preached there frequently for his work's sake. In these delightful services we were assisted by Rev. Bros. Rottenstein and Alexander-the former offered the first prayer and the latter administered the holy sacrament of the Lord's Supper at the close of the sermon. God evidently accepted the chapel as his dwelling place, the house of prayer and sacrifice for his people, and recorded his name there. Many realized his presence and were made glad by the benediction of his heavenly grace. Rev. Bros. Ogletree, Johnson and John were present to assist in the subsequent exerises of the meeting. Our first impressions of Montgomery were quite favorable. We learned that a Baptist church has been organized in this town, and that a handsome subscription for a church edifice has been obtained. See "The Texas Methodist Historical Quarterly," Vol. 1, No. 3, published in Georgetown, Texas by the Texas Methodist Historical Association on January, 1910, pages 236-237. Chauncey Richardson was the editor of the Texas Wesleyan Banner. Chauncey Richardson's article above is dated July 27th, 1851 which was a Sunday. Richardson writes that they visited the town for the dedication of Alexander Chapel "on last Sabbath." The Sunday before July 27, 1851 was July 20, 1851. July 20, 1851 was the date the Methodist Church in Montgomery was dedicated. See 1851 calendar here. The name of the preacher stationed in the town of Montgomery by the Texas Conference in December of 1850 was James G. Johnson. Above, Richardson mentions "Johnson" by name in the last paragraph of his article about the dedication of Alexander Chapel in Montgomery, Texas. The church at Montgomery, called "Alexander Chapel'" was dedicated by C. Richardson in July, 1851. After reviewing the "Journal of the church conference held at Montgomery, Texas, 1839-1850." I have discovered a number of very important historic facts. Prior to the building of this church in Montgomery in 1851, there had been no other churches as such in the Montgomery Circuit. There were only societies. A society was a group of Methodist believers who would meet at someone's house or other building such as Landrum's School House. For a short while, there was also a "campground" called Mt. Tabor. I will begin posting details from the "Journal of the church conference held at Montgomery, Texas, 1839-1850" This journal is located in the Oscar Murray Addison Papers in Box 2A103 at the Dolph Briscoe Center for American History at The University of Texas. As described by the Dolph Briscoe Center for American History, the name attached to the journal is a bit of a misnomer in that it gives the impression that the church conferences were held in the town of Montgomery between 1839-1850. The church conferences were quarterly and moved from one location to the next. One quarter the quarterly church conference would be at Landrum's School House, the next quarter it would be at Robinson's, the next quarter it would be at Fanthorp's, etc. On one occsion the quarterly meeting was held at the Lake Creek Settlement. Another big surprise found in the "Journal of the church conference held at Montgomery, Texas, 1839-1850" has to do with the parsonage and where it was originally located. Alexander Chapel was built on land owned by James McCown. James McCown had purchased this land from W. W. Shepperd in 1839, and W. W. Shepperd had purchased the land from John Corner in 1838. John Corner received this land as an original Mexican land grant from Empresario Stephen F. Austin in 1831. About three weeks after the church building was dedicated, James McCown deeded the land the church was built on to the church Trustees. To--- Deed * MONTGOMERY COUNTY. BEGINNING upon the West side of Pond Street and on the south side of Church Street where said Streets Cross at right angles set a stake from which a post oak 20 in. dia. bears E. one foot dist. THENCE SOUTH with Pond street 242 feet set a post from which a post oak 10 in. dia. bears South 21 feet dist. & Black Jack 12 in dia bears 14 º W. 6 feet dist. THENCE WEST 83 feet set a post , from which a black Jack 10 in dia. bears N 12 º W. 12 feet dist & Black Jack 8 in dia. bears S 60 º W. 20 feet dist. THENCE NORTH 133 feet set a post from which a hickory 40 in dia bears 12 º W. 9 feet dist and post oak 12 in dia bears N 54 º 30m W. 19 feet dist. THENCE EAST 33 feet set a post from which a hickory 10 in dia bears N 14 º 30 W. 31 feet dist. THENCE NORTH 109 feet to Church Street, set a stake from which a post oak 20 in dia. bears N 83 º West 36 feet dist. it shall be the duty of the stationed Minister or preacher (authorised as aforesaid) who shall have the Pastoral Charge of the members of said Church to call a meeting of the remaining Trustees as soon as conveniently may be and when so met the said Minister or preacher shall proceed to nominate one or more persons to fill the place or places of him or them whose office or offices has been vacated as aforesaid, provided the person or persons , so nominated shall have been one year a member or members of said Church immediately preceding such nomination and be at least twenty one years of age, and the said trustees so assembled , shall proceed to elect and by majority of Votes appoint the person or persons so nominated to fill such vacancy or vacancies in order to keep up the number of five trustees forever, and in case of an equal number of votes for and against said nomination the stationed Minister or preacher shall have the Casting Vote, Provided nevertheless that if the said Trustees or any of them or their successors have advanced or shall advance any sum or sums of Money or are, or shall be responsible for any sum or sums of money on account of said premises and they the Trustees or their successors be obliged to pay the said sums of money, they or a majority of them, shall be authorised to raise the said sum or sums of money by a Mortgage on the said premises or by selling the said premises, after Notice given to the pastor or preacher who has the oversight of the congregation, attending divine service on the premises, if the money due be not paid to said Trustees, or their successors within one year after such Notice given, and if such sale take place the said Trustees or their successors, after paying the debt and other expenses which are due, from the money arising from such sale, shall deposit the remainder of the money produced by the sale in the hands, of the Steward or stewards if the Society belonging to or attendung divine services on said premises, which surplus of the produce of such sale so deposited in the hands of said Steward or Stewards, shall be at the disposal of the next annual conference, authorised as aforesaid, which said Annual Conference shall dispose of said Money according to the best of their judgement for the use of the said Society. mentioned and sescribed lot or piece of Land with the appurtenances thereunto belonging unto them the said W. L. Gilliam F B Pankey I Worsham L Pinkston & L Dupree and their successors chosen and appointed as aforesaid from the Claim or Claims of him the said James McCown, his heirs and assigns. In Testimony whereof I have by my Attorney in fact A McCown set my hand and affixed my scroll for seal this 11th day of August A.D.1851. (County Court Seal) H B Boston Clk.C.C. M.C. H B Boston Clerk C.C.M.C. See Montgomery County Deeds, Vol. O, pages 383-386. This deed refers to the church the dedicated in July 0f 1851 where it records, "said Trustees are now having built on the lot hereinbefore described a house or place for worship for the use of the members of the Methodist Episcopal Church South"
This deed is also interesting in that it provides details regarding the early organization of the church such as the number of Trustees and the procedure by which Trustee vacancies were to be filled. It is interesting to note that there was once a street called Church Street that appears to have run between the property the Methodist Church was built on and the property the Baptist Church was built on. I have not been able to determine when the street called Church Street ceased to run between the two church buildings. James McCown had purchased the town of Montgomery from W. W. Shepperd but did not live there. James McCown's brother, Alexander McCown, did live in Montgomery and handled land transcations as James McCown's "attorney in fact." See the 1845 advertisement from the Montgomery Patiot below as example of Alexander McCown acting the Proprietor of the Town of Montgomery. Click here for some family history on the Interenet for James McCown and Alexander McCown. See the July 2, 1845 edition of the Montgomery Patirot, page 4, Special thanks to Mac Woodward, Curator of Collections, with the Sam Houston Memorial Museum in Huntsville, Texas for this scan of the "Town of Montgomery" advertisement found in the Montgomery Patriot newspaper. "McCown" Burial Vault in the "Old Cemetery" in Montgomery, Texas. According to a Texas State Historical marker, James McCown also donated the land for the Baptist Church in Marshall, Texas in 1849. James McCown is not buried in Montgomery, Texas. He was buried in Marshal, Harrison County, Texas. Someone attached a plaque to this burial vault and identified the deceased as James Alexander McCown. As shown in the deed above, James McCown and his brother, Alexander McCown, were two different people. James McCown had purchased the town of Montgomery from W. W. Shepperd in 1839 (the sale was concluded in 1840). Alexander McCown was James McCown's agent (attorney-in-fact) in the town of Montgomery. This is probably Alexander McCown's burial vault since he actually lived in Montgomery, Texas. The plaque does not appear to have been placed on the burial vault by a family member as the name is misspelled. The McCown brothers spelled their name "McCown" and it is mispelled "McCowan" on the plaque on the burial vault. Headstone of Mary Davis (1868-1944) in the "Old Cemetery" in Montgomery, Texas. The deed does not seem to provide any specific details about the Methodist church cemetery though the land description could very well include the land in the cemetery. The deed does not mention the cemetery or the 1842 Methodist parsonage as such. Link to the Montgomery United Methodist Church, Montgomery Texas today. 1 See references to Thomas Parmer (also as Palmer) in The Personal Correspondence of Sam Houston, Volume I: 1839-1845, (1996, University of North Texas Press) by Madge Thornall Roberts; and The Personal Correspondence of Sam Houston, Volume II: 1846-1848, (1998, University of North Texas Press) by Madge Thornall Roberts. On this page, we will add historical data pertinent to the history of the Methodist Church in Montgomery, Texas. The four most valuable sources to our research so far are Homer S. Thrall's book, History of Methodism in Texas, published in Houston, Texas by E. H. Cushing in 1872; "The Texas Methodist Historical Quarterly," Vol. 1, No. 3, published in Georgetown, Texas by the Texas Methodist Historical Association in January 1910; and Macum Phelan's A History of Early Methodism in Texas 1817-1866, (1924, Nashville, Cokesbury). We have had a chance to review this very significant primary document which is still in existence. This document appears to be extremely valuable to a study of the early history of the Montgomery Circuit and Montgomery Methodist church between 1839-1850. This document appears to have been used many times throughout Macum Phelan's A History of Early Methodism in Texas 1817-1866, (1924, Nashville, Cokesbury). Located in the Oscar Murray Addison Papers in the Dolph Briscoe Center for American History at the University of Texas at Austin [formerly the Barker Texas History Center] in Box 2A 103 is the "Journal of the church conference held at Montgomery 1839-1850." Oscar Murray Addison (1820-1898) was a Methodist minister in Texas. He retired from the ministry in 1889 and settled on a farm in Eulogy, Texas in Somervell County where he assembled a large collection of historical material concerning Texas Methodists. As previously stated, these materials are located at the Dolph Briscoe Center for American History at the University of Texas at Austin. Another potentially important primary document is located in the Oscar Murray Addison Papers in Box 2A 125. This is "Joseph P. Sneed's journal, 1839-1840." Following Strickland's assignment in 1838, Rev. Sneed was assigned to the Montgomery Circuit from 1839-1840. See details for Box 2A 103 and Box 2A 125 at: http://www.lib.utexas.edu/taro/utcah/00685/cah-00685.html. It will be interesting to see if these documents provide any helpful information about the "Old Cemetery" and/or early church members. HELP WANTED: We are currently looking for any deeds, maps, plats or plots for the earliest Methodist Church and the "Old Cemetery" in Montgomery, Texas. If you have copies of any of these documents, please let us know. We are especially interested in documents concerning burials in the cemetery and the first deed to the Methodist Church or its trustees for the land the cemetery and the first Methodist Church were built on. Here, we will include as many details regarding the early history of the Methodist Church in Montgomery, Texas and the cemetery as we unearth them. The goal is to develop the most complete history of the church and cemetery that we can.